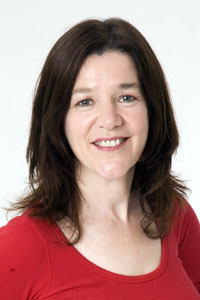 Máire Clerkin is an actor, Irish Dancer, choreographer, writer and teacher. From London of Irish parents, she moved to sunny California in 2003. You've heard the phrase, Jack-of-all-trades-Master-of-none? Well, Máire asks that you disregard it in relation to her. She tours her one-woman show (see Performances), teaches dance drama in schools, runs literacy through dance education programs, (see Teaching), leads Irish music & dance ensemble A Gaelic Gathering (see A Gaelic Gathering), acts, choreographs and directs freelance (see resume and Choreodrama), holds Storytelling workshops (see Teaching), adjudicates feiseanna (Irish dancing competitions) nationally and internationally and is also a voice actor - see separate website and listen to her voiceover demos on mauraclerkin.com. In 2008, her one-woman comedy play The Bad Arm - Confessions of a Dodgy Irish Dancer, was LA Weekly's Theater Pick and following fantastic press and audience acclaim at both Hollywood and Chicago Fringe Festivals, Maire wowed them at Dublin's Ceim Eile Festival and the New York International Fringe Festival in 2011, California International Theatre Festival and Santa Cruz Fringe Festival in 2012 and acclaimed performances in Minneapolis, Atlanta, Vancouver, Jacksonville, Sacramento and San Diego with numerous return appearances at Theatre Asylum in Los Angeles. Double Jigs? Double chins? Double gins? Máire's passion for traditional Irish music comes through in her choreography. She has been privileged to work with fabulous musicians on both sides of the ocean. In 2003, Máire left behind a tremendous pub scene in London with its rich history of seisiuns that stretched into the night. Arriving in Los Angeles, she was delighted to find a wealth of people playing fiddles, whistles, pipes, bodhrans, and banjos, in a town more famous for facelifts than craic. Pass the botox!